Summer is a perfect time to visit Edinburgh, both to explore the city and to discover the rest of Scotland. From ancient Roman ruins to picturesque villages to whisky distilleries, you can find it all in and around Edinburgh. Here are a few ideas. Go for a boat ride on Loch Ness and use a sonar system to listen for Nessie, aka the Loch Ness Monster. Enjoy the natural beauty of Cairngorms National Park. Ride the West Highland Railway Line in the Scottish Highlands, better known to “Harry Potter” fans as the Hogwarts Express. Visit Eilean Donan Castle, one of the most romantic castles in the region. Tour the iconic Edinburgh Castle, which towers over the city and is part of the UNESCO World Heritage–listed Edinburgh Old Town. Follow one of four routes around the city on a hop-on hop-off sightseeing bus. Walk the Old Course at St. Andrew’s and visit Scotland’s oldest university. Take a walking tour of medieval Edinburgh and the Royal Mile. Visit Roman ruins such as Hadrian’s Wall and Birdoswald Fort. Learn about Scotland’s whisky-making history—and taste a few wee drams—on a whisky tour. Venture to the Scottish Highlands and spend two nights at the Isle of Skye, including a Jacobite steam train ride on the West Highland Railway Line — aka the ‘Hogwarts Express’ of Harry Potter fame. This 3-day guided trip from Edinburgh takes you through Cairngorms National Park to regional highlights such as the Old Man of Storr and the Cuillin Mountains. Visit Eilean Donan Castle, ride the ferry to Mallaig and stop at the legendary Loch Ness. Enjoy daily breakfasts during your hotel or B&B stay in Portree. Build your own custom (and cost-efficient!) tour of Scotland’s best attractions with the Historic Scotland Explorer Pass! With your 5-day or 14-day pass, visit castles, cathedrals, distilleries and more! Make the most of the advanced ticket entry at popular sites like Edinburgh Castle and Stirling Castle, and discounted audio tours at select venues. With free entry to more 77 attractions around the country, the Explorer Pass offers something for the whole family. Discover the Edinburgh Vaults — aka South Bridge Vaults — 18th-century underground chambers that lie far below the city. On this underground walking tour with an entertaining and informative guide, hear tales of this dark and almost-forgotten place built below one of Edinburgh’s busiest thoroughfares. You’ll see evidence of excavated storage spaces, human habitation, taverns with wine vaults and more! Explore a sinister side of Edinburgh on this late-night ghost walking tour that includes the Blair Street Vaults under South Bridge. Stroll mysterious alleyways as you listen to your guide’s grim and ghastly tales of treason and torture. Then venture underground for a candlelight tour of the 18th-century chambers and hear haunting stories of supernatural forces lingering in the city's darkest corners. Take an in-depth look at one of Scotland’s most famous tipples on this whisky master class in Edinburgh. Follow a guide around the Diageo Claive Vidiz whisky collection — the largest collection of Scotch Whisky in the world — and gain insight into the 3,384 bottles’ origins. Challenge your taste buds and see how you score on a blind taste test of blended, single grain and single malt whiskies. Hear how different wood barrels influence the character of different whiskies in aging, and learn about the fine art of blending. Ride through Edinburgh in a glass-roofed, convertible mini coach on this 50-minute hop-on-hop-off tour. Learn the history, culture and traditions of this UNESCO World Heritage Site with a small group of fellow travelers, limited to 15 people or fewer. 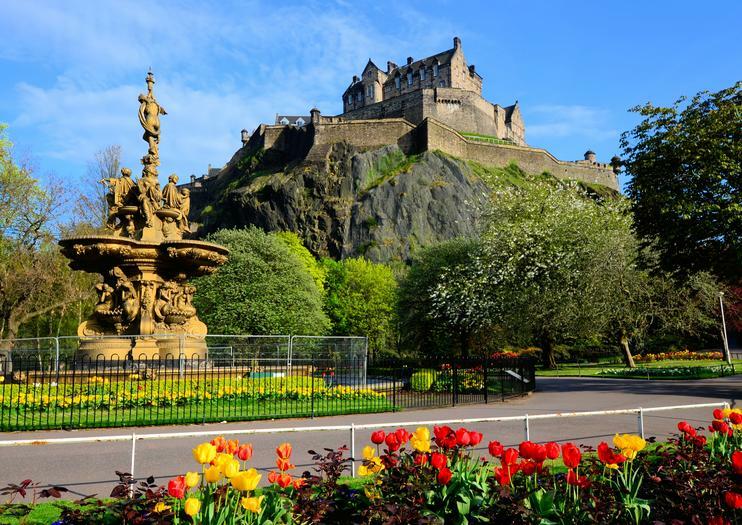 Stop by some of the area's top attractions, such as the Grassmarket, Edinburgh Castle and Edinburgh’s central university area. Hear an insider's perspective on the vibrant city via the onboard audio commentary.